Did you know that Portsmouth, NH, is less than a 25-minute drive from Dockside Guest Quarters? 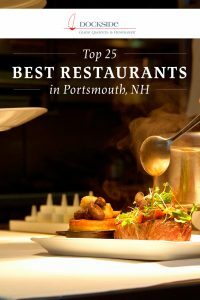 With just a quick drive South, you will find some of the best food while visiting restaurants in Portsmouth, NH. This chef-owned bistro and wine bar’s menu draws inspiration from the simple country cuisine of the Mediterranean. Blue Mermaid Island GrillThis Caribbean-inspired grill located in downtown Portsmouth will not only delight you with their delicious food, but also their live entertainment. Stephan Mayeux, the chef, and owner, has taken his classical French training to prepare delicious original, yet creative meals. Casual atmosphere? Check. Great food? Check. Head down to this restaurant for British & American pub fare. If you’re looking for authentic Italian food with a casual atmosphere, this is the place for you! Two friends with a dream created this quaint little spot. Enjoy Mediterranean food and a two different wine bars here. Not only does this restaurant have great curb appeal, but they also offer decadent New England comfort cuisine. Get your Mexican food fix at this restaurant that serves only the freshest, most delicious, and healthiest ingredients. This restaurant provides its customers with exceptional seafood in a hip and fun atmosphere. From the authentic French pastries to the excellent coffee and tea, this new concept restaurant is a must while in Portsmouth. Initially built as a ferryboat terminal, you can find seafood, sandwiches, and burgers at this unique restaurant. Located in the heart of Portsmouth’s historic Market Square, you can find delicious sandwiches, pastries, and desserts at this café. This traditional pub fare ranges from homemade clam chowder to wood-fire grilled burgers and chicken sandwiches. RadiciThis is the perfect place to experience authentic tastes of the Old Country combined with an intimate atmosphere including low lights, candles, and cool music. This Italian restaurant offers dishes from all regions of Italy with its quaint brick and stone ambiance. Enjoy classic New England seafood right on the water at River House Restaurant. This eatery has won first place at Portsmouth’s Prescott Park Chowder Festival three years running. This cool, quiet, classic modern restaurant offers savory American-style dishes in an unbeatable atmosphere. Every day, this restaurant gets its seafood straight from the water to meet their high standards of excellence. Start your day off right with a delicious American–style breakfast buffet including everything from fresh fruit to waffles. Whether you’re looking for a great meal or something to meet your gluten-free standards, this deli will not disappoint. With so many delicious eateries practically in our backyard, complete your visit by staying at Dockside Guest Quarters. If you don’t feel like making the short trek to Portsmouth, you can always find a delicious meal at our restaurant. Offering the feeling of a yacht club without the pretense, our York Maine restaurant features a diverse menu rich in regional New England seafood specialties and local, organic fare. We look forward to booking your stay here at Dockside Guest Quarters.